Dr. Badalà shows his wide casuistry with indications (staminal cells deficit,cornea rejections, etc) and the risks of using Boston Keratoprosthesis at the American Academy of Ophthalmology’s congress in 2006. The most frequent risks are glaucoma and possible infections. 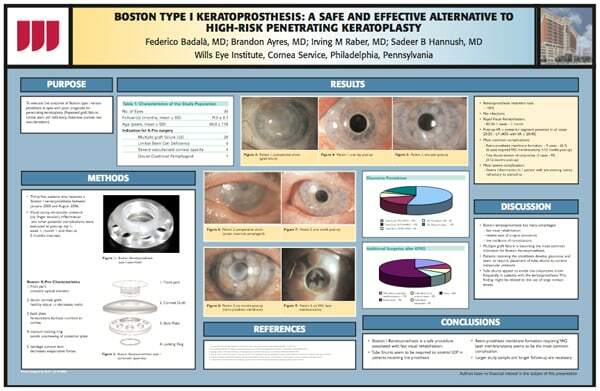 Boston Keratoprosthesis, with its lower-risk of complications, is the most used artificial cornea in the world. Furthermore, surgery is a safe and effective procedure. I underwent DMEK (an endothelian cornel transplant) in my right eye over a year ago. The corneal transplant was performed by Dr. Badalà. My vision was very bad, 20/200 in the affected eye and it was bothering the visio... Keep on reading this reviewn I had with my better eye, making it very difficult to use the two eyes together, specifically when driving. All eye examination before and after the operation were performed in the excellent Eye center located in Catania. The corneal transplant with the very new technique DMEK (Descemet Membrane Endothelial Keratoplasty) was carried out in Milan in a private hospital, accredited with the National Healthcare,with state of the art equipment and was totally free of charge for me. The surgery was under general anesthesia without complications. The only real problem, which was extensively explained by Dr. Badalà, is that I had to stay flat in bed for the first day with my head facing the ceiling. This is because the new endothelial cells transplanted are kept in place by a small air bubble. I was allowed to move every half an hour and from the next day I was allowed to go back to a normal life. The time in the hospital - one night - was fast and warmed up by a very kind nursing team and frequent encounters with the doctor, who was always answering my questions, showing confidence and humanity. No patching and fast progressive visual rehabilitation surprised me. Two months post-op. visual acuity was 20/40, similar to my better eye. Six months after visual acuity is 20/25 much better and clear than my “older” good eye. I’m convinced that corneal transplant surgery is complex and requires high technology and a lot of experience, when a surgery like this seems simple and routinary, that means that the eye surgeon is really good. Thank you Doctor Badalà, I’m starting to think seriously about getting a corneal transplant in the other eye.